We get this question almost daily. There are some very important considerations to look at when comparing Short term health and Cobra. We'll walk through these as well as how the two coverage options differ. We'll also look at the individual/family option including Covered California. Let's find the best way to insure you following loss of group coverage. Cobra (or Cal-Cobra for smaller companies) is basically continuation of your employer plan after you leave the company or become ineligible for the group plan. You generally have at least 60 days to start the Cobra following your last date of group coverage. For example, if your coverage ended on May 31st, you would generally have through June and July (60 days) to send in your payment and opt in form for a June 1st eff date. At the time of Cobra, you may be able to change plans if there are other options available. You can also piecemeal coverage by family member and type of coverage. For example, you may be able to take the medical for you just and the dental for your spouse (if they were enrolled). Cobra can be very expensive! Most likely your prior company was picking up at least 50% of the employee's cost. Cobra is the full amount...sometimes with an additional 10% for smaller companies. There's a fair amount of sticker shock when people get their Cobra notice. Which usually leads to people researching other options. Enter individual family coverage including Short term health plans! One such option is Short term health. This is usually a cost concern. Cobra is just unaffordable...especially if a person just lost their job! 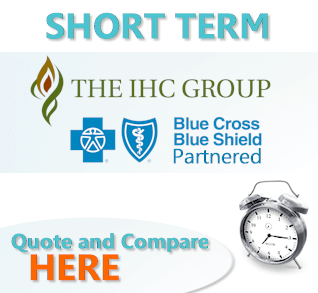 So what is Short term coverage? Short term plans allow you to cover a fixed period of time with a simplified underwriting process. Currently, we're allowed month to month coverage in 3 month blocks. Find out more about movement towards 364 days expansion of short term here. This works well for a person that is expecting coverage to start from a new company and is expecting pretty quick turn around. Waiting periods these days for new coverage generally run from 0 to 3 months. This coincides nicely with the 3 month block of short term. We are slated to have an expansion of short term to 364 days. The big benefit to short term is that it tends to be much less expensive than Cobra. There some trade-offs to consider when comparing the two. Short term is very different from Cobra. Let's go into each of these and see how they compare with Cobra. This is a big deal if you have serious health issues. You must qualify based on health for short term coverage. Cobra is guaranteed issue. This means you can enroll regardless of health as long as you pay your premium and opt in within the 60 day window. The health questions are pretty serious so most people are able to qualify. If you're unsure, you can apply for Short term prior to the 60 day window for Cobra to see what they come back with. We don't lose our Cobra option as long as we're still in the 60 day window. 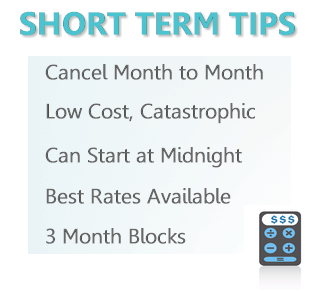 Short term is basically offered for 3 month blocks. You can cancel month to month but after 3 month, you have to re-enroll and re-qualify based on health! Cobra coverage will continue for up to 18 months and occasionally an additional 18 months if offered Cal-Cobra extension. If you're really looking at a short period of time (waiting period, new job, etc), that's not an issue. What you don't want to happen is go longer and develop a health issue. Short term is really designed to cover big ticket items. It does a good job of this! It does not cover preventative, pre-existing conditions, and day to day benefits (prior to deductible). It's there for the big What If! Cobra on the other hand is generally comprehensive depending on the group plan that was in place before. This is likely ACA compliant with coverage for office, medication, lab, maternity, and full list of Essential health benefits dictated by law. If you have existing health care needs or expect some after losing group coverage, Cobra may be the better option. As part of the ACA law, there is a penalty for not having qualified coverage. The penalty is slated to go away in 2019. 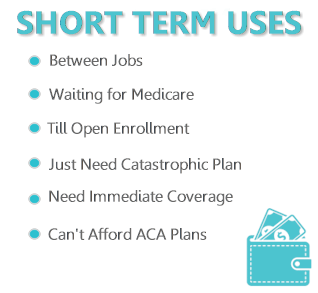 Short term plans are not ACA compliant. Cobra coverage most likely is. Officially, there's a penalty on the books for not having health insurance. There's a question since 2016 as to whether the IRS will enforce this penalty. The penalty is slated to go away 2019 and beyond! We're not foolish enough to say what the IRS will do but it's definitely something to consider when comparing short term and Cobra. Cobra is usually really expensive. People will call us and say that it's not really an option. 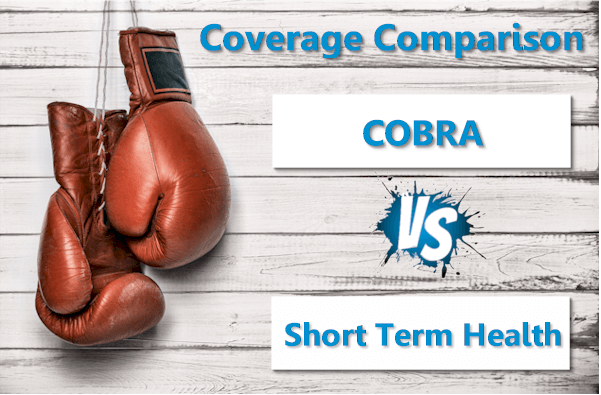 You can quickly quote Short term coverage here to compare with the Cobra option. There's one important piece we need to talk about. It's not Cobra or Short term but it generally factors heavily at this time. Losing group coverage is a qualified event for Covered California. We now need to compare Cobra and Covered Ca (with a potential tax credit) and short term. We wrote an entire article on Cobra versus Covered California since it's pretty involved. If you qualify for a tax credit based on income, Covered Ca probably makes the most sense. As long as your doctors participate. The Covered Ca networks are generally smaller than Cobra networks. Important note...if you take short term, you may lose your Covered California option. Feel free to check out our total Short term health guide here. Our assistance is 100% free to you as Certified Covered California agents. Call us at 800-320-6269 and we can go through any questions or run your Short term health quote here. Thanks!